Academia (noun): the environment or community concerned with the pursuit of research, education, and scholarship. 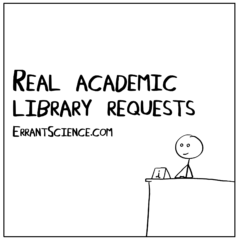 Readers of this blog will more than likely be familiar with academia. But how do you feel about this definition? I would agree with it, but in my opinion academia today is concerned with the pursuit of research, education and scholarship – at the expense of the individual. Yes, we hear and know of those who have wonderful experiences in academia – they thoroughly enjoy their degree, move on to a Masters and/or PhD, supported by their peers and supervisors, and stay on to lead their own research labs. But, in my experience, that is by far not the norm. Perhaps it is just who I have associated with, or resonated with, but I think many people have an unhappy time in academia. Or at least, they face challenges that they should not have to face, be that because of their gender, age, skin colour or disability, or because of failings in the system itself. Let me explain. I am nearing the end of my PhD, and all I can see around me are those who are struggling, and those who are either blind to or deliberately ignoring the people struggling. I hear stories from my fellow PhD students after meetings with their supervisors. One told me that their supervisor, when they were doing their PhD at a prestigious UK institution, had to do it alone – their supervisor at the time left, and they just had to cope. To put this in context, the student had been telling their supervisor that they were finding things a bit difficult, and this was their response – essentially saying “I had a tough time and I got on fine”. Now of course you could take that story in an inspirational way, but actually the message that sends to me is “your problems aren’t as bad as mine were, stop moaning”. There seems to be a culture in the more senior academics of “my PhD was really difficult, therefore yours should be really difficult too”. This reinforces all those myths around PhDs that you need to work 60+ hour weeks, never take holiday, work when you’re sick, etc. It’s just not healthy, and it’s not sustainable – for an individual, or for academia itself. As the world wakes up to the importance of mental health, young people aren’t going to want to be part of a work environment like that. It’s not just that side of things that is putting academia at risk, either. Money is another. It all starts at the PhD level. If you’re lucky, your project will be funded and you’ll get a stipend (salary). It won’t be vast quantities of money, but it will (hopefully) be just about liveable. It’s when you approach the end of your PhD that the problems begin. Do you have a designated writing-up period? 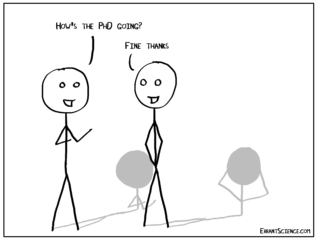 For many PhD students, this isn’t funded. So, that’s say 6 months of living with no money. What other industry would expect you to do 6 months of work without paying you? Or perhaps your lab head has found some spare cash for you, but you have to run different projects on the side, effectively still writing up your thesis in your spare time. And what about post-viva? Most students have corrections of varying size, and this is almost definitely not funded. But you get through that – it’s only temporary, right? And you land a post-doc, after months/years of searching and having to do other jobs in the meantime to make ends meet. And then you realise that your contract is temporary – 1 year, 2 years, maybe 3 if you’re lucky – and then you have to go through that all again. But don’t worry, it’s only temporary, right? So you get through it and finally get to the position where you’re pursuing your own research, maybe supervising some PhD students yourself. But you’re plagued with needing to apply for grants to make your research-ends meet. They’re all consuming. That’s not the fault of academia – that’s just the way research is funded. But in being swept up in that never-ending, competitive hunt for cash, again, you start neglecting your PhD students, and the cycle begins once more. All this, and I’ve barely touched on the numerous problems of open-access literature and journal impact factors. But I think that is a post for another time. Perhaps I’m just being very cynical, but it seems like an unsustainable system. More and more often we hear of PhD students who have a taste of research, and despite enjoying it, developing useful and unique skills and being good at it, they see their future – of practically nil job prospects, struggling to make ends meet, and lots of stress – and decide to leave academia. And can you blame them? What we need is some bright young people to make a stand, stay in academia and try to change it from within. I know of some truly wonderful academics, lovely personable people who would bend over backwards to help their students – but in my experience these are few and far between. We need more of those. I’m not completely sure of the best approach to give the archaic system of academia a 21st century refresh, but I would be interested to hear other people’s thoughts.